Both today, Friday 28th, and on Monday 31st May nearly all of Glasgow’s museums, libraries and sport centres will be closed by industrial action. The strike involves Unison, Unite, GMB and Bectu unions who have collectively 1,600 members working in over 140 facilities - from Kelvingrove Art Gallery & Museum to local libraries and pools. According to Unison, ‘Unions at Culture Sport Glasgow (CSG) are fighting a 10% wage cut for 150 workers, a pay freeze for all other staff and cuts in public holidays and overtime rates’. CSG workers also struck on election day earlier this month and even threatened to picket poll stations before a last-minute injunction banned the action. Workers are concerned not only with the long-term attacks on their own pay and conditions but also the changes that CSG – an ‘arm’s length’ organisation set up by Glasgow City Council in 2007 and receives receives public and private funding – are making to the city’s cultural and leisure institutions. CSG has consistently pushed for greater control and influence by private companies. Free public access – a right enshrined from the beginning of Glasgow’s museums – has already been undermined with the increase of paid exhibitions as well as a clear move away from free temporary exhibitions. 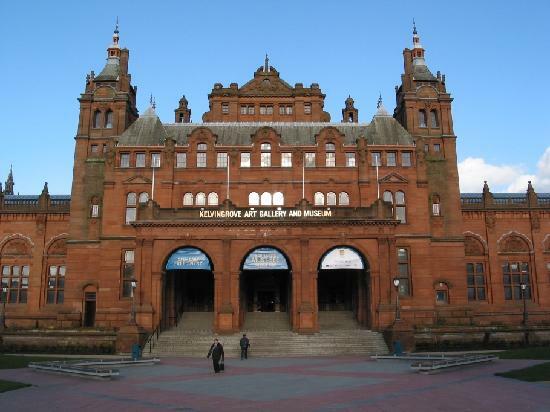 Apart from the biggest museums, such as Kelvingrove, it is little known that many museums are now closed to the public (not including fee-paying school trips) on Monday, despite staff working the full day. Indeed, CSG’s strategy is reported to no longer be primarily concerned with visitor numbers per se; i.e. attracting ordinary Glaswegians. Large-scale projects, such as the new Museum of Transport which is being built at a cost of £79 million and will undoubtedly go over budget, not to mention the great folly of the 2014 Commonwealth Games, mean investment will be diverted from the maintenance of existing buildings (some of which are in dire need of repair), services as well as staff’s wages towards projects which create good PR and are good for business interests. Those at one picket line today were anxious about the threats posed by the Games and the inevitable further cuts in council budgets. Since CSG took over from Culture and Leisure, the number of managers has increased, there has been a marked reduction in the quality and access to services and workers have grown more angry and more militant. Only the wider solidarity of working class Glaswegians in defence of the staff and the people’s facilities and heritage can scrap CSG’s and Glasgow City Council’s plans for our city.